RUNNING WITH OLLIE: Guess Who was Mentioned in Runner's World? Bart Yasso. Just kidding. ME. And truth be told, it wasn't exactly in Runner's World, but I was mentioned in an article on www.runnerworld.com. This morning after my long training run for the Dallas marathon, I was back in bed under the covers recovering as I was scrolling my Facebook feed on my phone. 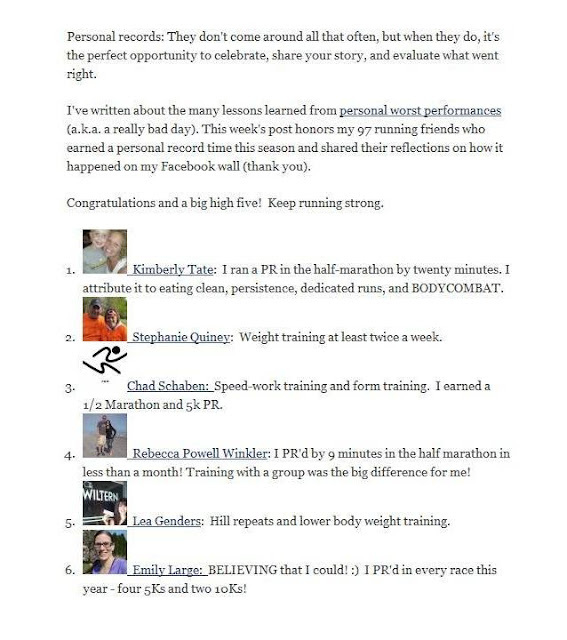 I clicked on an article from www.runnersworld.com titled "97 Ways to Run a Personal Record," because who doesn't want to read more about how to earn a new PR? It turns out it was a collection of responses to a question they asked on their FB page. "Here's what 97 Facebook friends did to reach their goals." So just imagine my shock and surprise when I saw my own name staring back at me! #5. Lea Genders Hill repeats and lower body weight training. I'm not sure exactly when I gave this answer, but had I realized it was going to be used for a Runner's World article online, I think I would have crafted a more thorough response. I thought I was just playing along to a FaceBook request from a Runner's World status and casually typed in my answer from my phone. I see so many runners shying away from weight training their legs because they don't want to be sore and mess up their run schedule. The truth is that you may be sore at first if you are not used to weight training your legs, but ultimately strength training helped me become a better, much faster runner. For me, stronger legs were faster legs. I absolutely credit my PRs to weight training (and yes, hill repeats). Quote that Runner's World! It was nice being mentioned in a Runner's World article, I just wonder when they will put me on their cover? I'll be waiting by the phone. Haha, a friend of mine is also in the post! Nice!